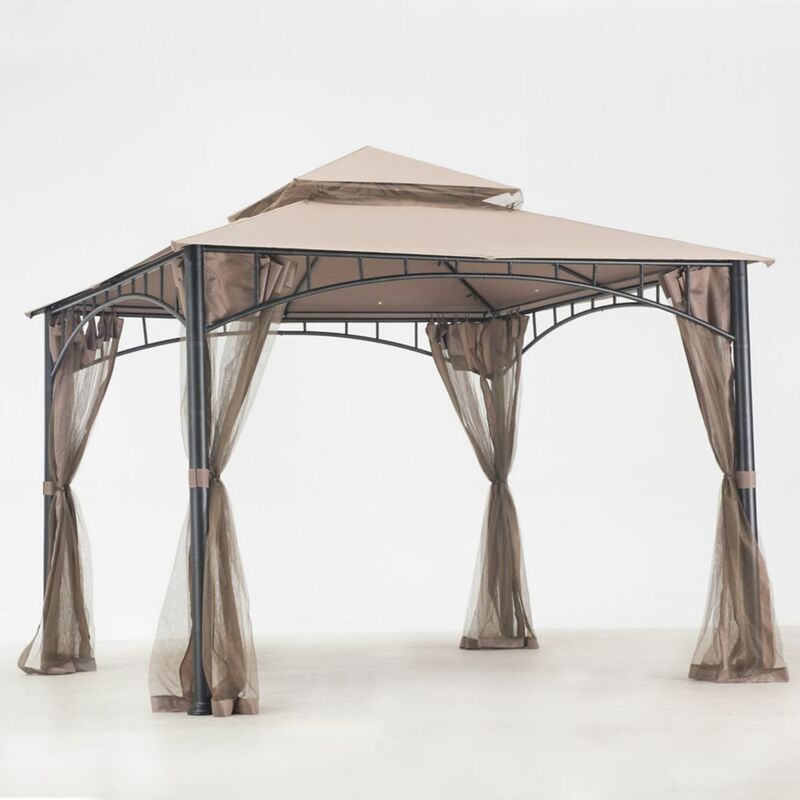 Instantly transform your backyard, pool, or patio into a new favourite hangout with the addition of this handsome Marla Gazebo! This gazebo features a black frame and a tan cloth roof, making it both stylish and extremely versatile. With plenty of room for dining or lounging, you'll be able to entertain or relax in style and safety from the hot sun and rain. An included mosquito net keeps away unwanted pests so you can enjoy fresh air in peace. Marla 10 ft. x 10 ft. Gazebo with Vented Canopy Instantly transform your backyard, pool, or patio into a new favourite hangout with the addition of this handsome Marla Gazebo! This gazebo features a black frame and a tan cloth roof, making it both stylish and extremely versatile. With plenty of room for dining or lounging, you'll be able to entertain or relax in style and safety from the hot sun and rain. An included mosquito net keeps away unwanted pests so you can enjoy fresh air in peace. Marla 10 ft. x 10 ft. Gazebo with Vented Canopy is rated 4.1 out of 5 by 19. Rated 4 out of 5 by WooHoo22 from Very pleased Ordered it online and it came within a week. Took 2 people to set it up. Took us about 2 hours from start to finish. I bolted it directly into my deck but there were spikes to secure into the ground. Directions were easy to follow. It has handled crazy rain and wind storms. It's very solid. Only odd thing is the grommets in the roof canvas. When it rains for any length of time the rain comes in through them. They are located near the edges (two on each side). The screens are able to zip up easily and look nice pulled back. Rated 5 out of 5 by macka from Great features Clear instructions for easy assembly, although do need 2 people. Good quality materials. Am enjoying the result. Good value. Rated 4 out of 5 by MuskokaClassic from What You See Is What You Get After my usual over researching we decided on this unit. I had originally thought of a metal roof model but being a resident of Muskoka I though about winter. There is no way those metal roofs would survive. And acrylic...forget it. Canvas roofs can be removed and stored. The unit went up very easily and is well constructed. You'll need a helper for some parts. Low aggravation level overall. In use the unit works well. The bug screen works well too even with the gap between the top of the curtain and the roof. Overall we are quite happy with the unit and would have no hesitation recommending it. Rated 1 out of 5 by NewEnglandPurchase from We were very disappointed with the quality of this. We had the exact same one several years ago ... We were very disappointed with the quality of this. We had the exact same one several years ago that held up well, but over time became unstable as we live in a very windy location. We replaced it with another brand for a few years. When that one went, we ordered another of these. The quality of this one versus the original one we purchased is much, much worse. There are huge gaps between metal pieces on the top frame and the only thing holding them together are two 1/4 circles of welding material. The screens no longer have ties on the bottom to tie them to the sides of the poles. The quality of this product has gone significantly down hill. I would not recommend this. Rated 4 out of 5 by MP56 from So far it has held up well and withstood some... So far it has held up well and withstood some substantial winds. It is taller than most gazebos, which makes set up and (I assume) takedown a little challenging, but the height adds to the comfort level inside. The canvas top may be an issue by the season's end, because it isn't as well-reinforced as it should be in some areas. The screen system also does not contact the edge of the top, so there is a substantial gap that allows bugs to come in, and the screen at the cupola level does not have a velcro seal around the perimeter, again, allowing gaps where bugs can enter. However, it's better than no screen at all. Overall we like it so far. Rated 5 out of 5 by Ian from Items was delivered on-time and complete. All parts were included. The instructions as well as th... Items was delivered on-time and complete. All parts were included. The instructions as well as the set-up were clear. Upon completion, the Gazebo looked strong. The manufacturer was easy to work with and answered questions. Rated 4 out of 5 by Tom from This replaced the same unit that was destroyed in a tornado. I just hope I never have to deal wi... This replaced the same unit that was destroyed in a tornado. I just hope I never have to deal with Sunjoy customer service. These people are the worst. Totally out there. I only bought this unit to reuse the main support posts that were still standing.